Fifteen young racers from Guyana, Barbados and Jamaica will face off at Bushy Park Barbados tomorrow and Sunday when the inaugural Caribbean Junior Karting Academy Trophy (CJKAT) gets underway. 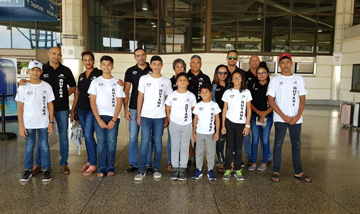 Six Karters will be representing the Guyana Motor Racing and Sports Club (GMRSC) and in addition to battling for the honour of becoming the first regional Champion, the grand prize of an entry in the Sunshine State Karting Challenge (SSKC) in Florida is also up for grabs. The young Karters and their guardians/parents arrived in the land of the Flying fish on Wednesday ahead of this Weekend’s two-day race Meet. Added incentives include trophies for the top three finishers and medals for all participants while the Champion will win a fully-paid entry and X30 Junior Kart for one SSKC weekend, valued at over US$3,000. Sponsored by Bushy Park Circuit Inc. (BPCI), Chefette Restaurants Limited, Sol Petroleum and Terra Caribbean, CJKAT will be contested by racers aged 11 to 15 years-old at three double-round meets with the first this weekend, the second on February 2nd and 3rd and final meet will be March 2nd and 3rd. CJKAT is modeled on the CIK-FIA Karting Academy Trophy, which is the first step on the ladder of the Federation Internationale de l’Automobile’s (FIA) single-seater path to F1 since 2010. Guyana’s participants are, Paige Mendonca – 60cc Kids Cup, Rayden Persaud – 125cc X30 Junior, Zachary Persaud – Easy Cup Rookie, Elan Rahaman – 125cc X30 Junior, Nathan Rahaman – 60cc Kids Cup and Jeremy Tenpow who was the GMRSC Karting Championship 2018, overall winner. Each Meet will have four races while grid positions for the first race will be based on qualifying. In the second race the grid will be decided based on qualifying, with the top 10 places reversed and the rest of the field in order of qualifying. While the third race will grid the drivers based on their best lap time from Races 1 and 2 and the final race will be based on points scored in qualifying and races.